Home » When and where are we surveying? The survey area (red outline) includes a ‘coastal ribbon’ zone. Survey lines are north–south with every 10th line (2 km separations) shown. The survey acquired about 60 000 line-kilometres of data. The airborne survey took place between August and November 2013. 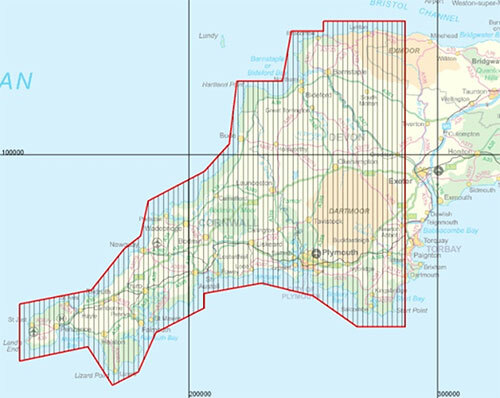 The majority of the south west region covering most of Cornwall, Devon and part of Somerset was surveyed. The survey started in the west (2 km west of Land’s End) and progressed eastwards towards Exeter. The survey plane typically flew at 80 m altitude over rural areas and higher than 240 m over urban areas. Flights followed a systematic 'back and forth' pattern of linear north–south transects across the region with a flight line spacing of 200 m.
Survey progress was monitored by a weekly updated flight plan. Who are we and who has paid for the work? The project will be delivered by a partnership of NERC research centres, the British Geological Survey, the British Antarctic Survey and the Centre for Ecology and Hydrology, working in partnership with government, regulators, industry and universities based in the region. The airborne geophysical contractor is Fugro Airborne Surveys (Pty) Ltd.